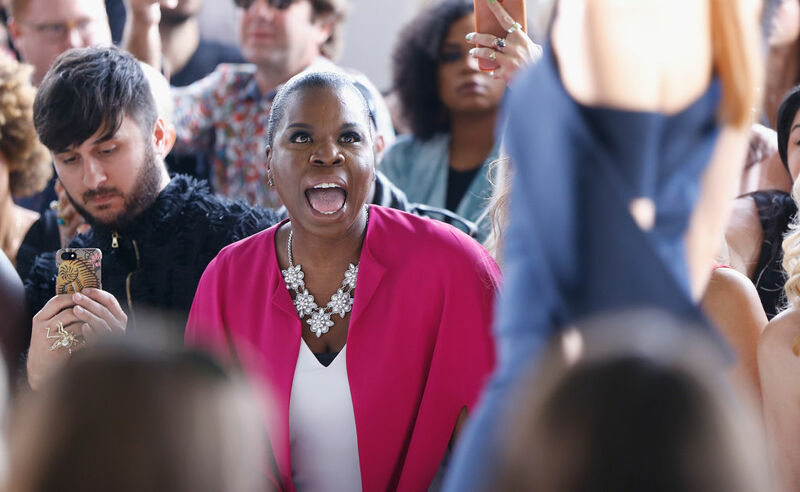 Quick: Someone hire Leslie Jones to be the official New York Fashion Week hype woman. Because if her enthusiasm in the front row at Christian Siriano’s recent show is any indication, she’ll have every model and show guest smiling by the final curtain call. During Siriano’s Spring 2018 presentation on Saturday evening, Jones lovingly hollered at model Coco Rocha as she strode by, calling out, “I love you Coco! I love you!” and “Come one now!” Typically, fashion show guests remain pretty much silent, taking in the collections or snapping photos, so Jones’ amazing antics were a welcome change. Rocha, in a striking black gown, stopped near Jones and flashed her a smile, clearly loving her enthusiasm. Because really, who wouldn’t want Leslie Jones at your side, cheering you on like the proudest parent ever? For those who don’t know, Jones and Siriano became friends after Siriano stepped up to dress Jones for her Ghostbusters movie premiere in 2016 when no other designer would. The two have clearly remained in touch, given Jones’ prime spot at NYFW. And seating Jones front row proved to be a great move, since she brought life, energy, and joie de vivre to the show. What’s not to love? We just hope other designers catch on and extend more fashion week invitations to Jones — and soon. For the rest of us who couldn’t catch Jones live at New York Fashion Week, she’ll be back on our televisions on a regular basis soon enough. She’ll return with the cast of Saturday Night Live on September 30th, and we’ll get our weekly dose of Leslie. But for now, we can just appreciate this amazing woman and her joy at NYFW.